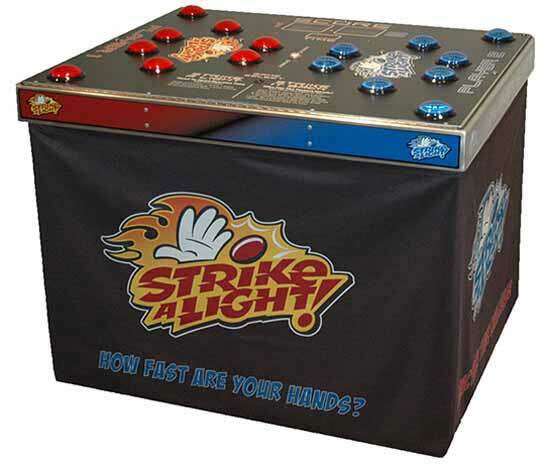 Strike a Light is the fourth co-ordination and reaction speed game that we've added to our range to go alongside Light Chaser, the brilliant Batak Lite, and the two player head-to-head Lights Out and is best described as a 21st century version of 'Whack-a-Mole'. Strike a Light can be played by two players head to head or one player competing alone. When in two player mode you can choose between two different games. In the Strike a Light game option it's a straight competition to strike as many of the randomly illuminating lights as possible in 30 seconds scoring one point for each hit but losing a point if you hit an unlit target. The second game option is a two player game called Strike it Back. In this game when you tap an illuminated light is goes out on your side and lights up on the opposite players side. The first person to light up all their opponents lights is the winner. The game requires an overall operating area of 2.1x1.4m and access to a mains electric socket is required. The game is suitable for use by ages 8 to adult. Strike a Light, as well as our other three reaction games, are perfect for all types of event whether as an attraction to draw and engage visitors on an exhibition stand, side entertainment for corporate events, or fun at parties and receptions. We offer these games for hire across all of the Midlands and much of the United Kingdom. If you have any queries, questions, or would like to hire one of our Reaction Speed Games for your event please click here to enquire and we will do all we can to help.